Hello and welcome to our Go Fund Me campaign. We're Something Underground and with Of Our Own Making we're making theatre that asks fiddly questions about radicalisation, grooming into gangs, refugees, Brexit, Chilcot, the Iraq war, terrorism, tabloids & fear. 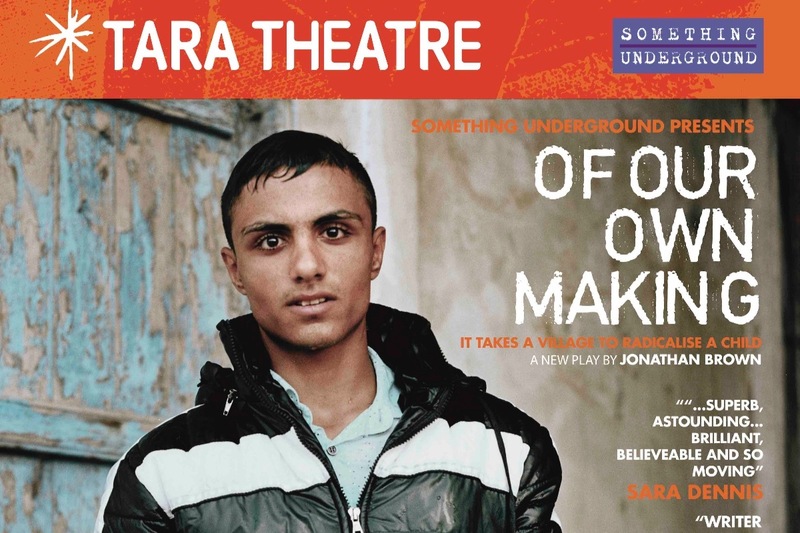 After years of young people being groomed into terrorist groups, drugs gangs, or Far Right groups, Award-winning Something Underground's new play “Of Our Own Making” (by Jonathan Brown) asks many uncomfortable questions, at renowned hub of diversity in London-based theatre, Tara . Set against the Syrian refugee crisis, OOOM follows the plight of 4 seeming refugees and their journeys from the shores of Libya into the heart of Europe, and of one of them into the heart and bed, of an unsuspecting tabloid reporter; asking along the way, questions of the role of the Iraq war, the Chilcot enquiry, the tabloid press' demonising of immigrants to swing a Brexit, and a simplistic view of the radicalised or conscripted, from the media and politicians. Parallel to the main plot we witness the online grooming of an isolated young boy, (username: Parsifal) watch his slow decline out of the hands of a society that has forgotten him, and into the hands of those who prey on this disenchantment. If the boys get to grips with the scenes, they'll perform alongside the professional production. Our central image has been provided to us by mulit-award-winning photojournalist Loulou D'Aki . We also have lovely actors Vincent Kerschbaum, Erin Elkin, & Hamza Siddique. Our expected 4-figure audiences who'll attend the show. Attendees at our free theatre workshops, their families and friends. Employment for wide range of creatives, (actors, directors, writer, movement director, musician, lighting designer, tech operator, SM, photographer, Project Manager, venue managers, marketing officers, FOH sstaff, venues, catering companies, printing companies. This campaign is one vital part of our budget for a project that includes funding and in-kind funding from the several quarters, and we hope, including YOU. How soon we need the funds? What the support will mean to us? Well... we've been working on this project since Autumn 2016 getting it to fruition. 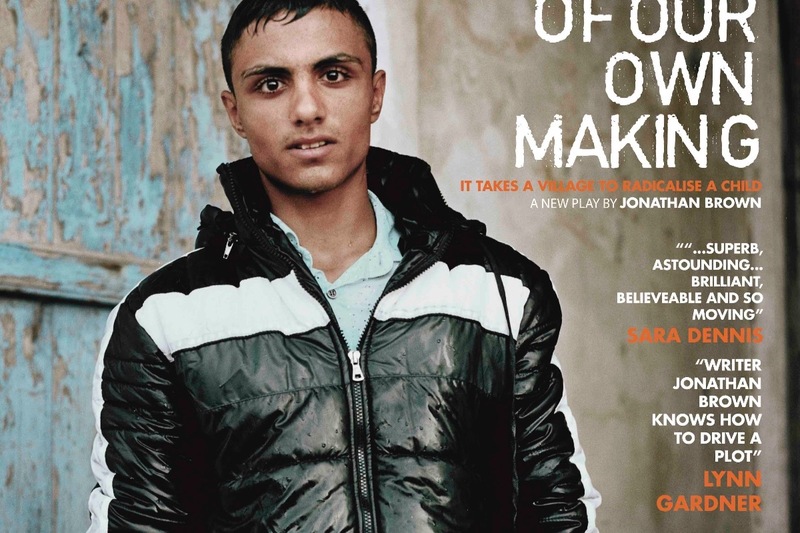 It's been a long road, and we've been gently steered by events toward making it possible to not only produce the play itself, a play that really asks us to find the humanity in all, (never mind who is demonised and who is demonising.) but also to work with young men who can both explore issues of vulnerability to online predators of all shapes, and can (with our guidance) devise great theatre scenes, and see them performed. Your donation (however large or small) will help to make all of this happen! It's very exciting to be able to bring so many wonderful people together. For a £10 donation ("Leg up") As "Helping hand" + website mentions. For a £15 donation: ("Good turn") As "Leg up" + programme mention. For a £25 donation ("Rock"): As "Good turn" + 2-4-1 tickets. For a £40 donation ("Angel") As "Rock" but proper boxed programme listing + copy of poster. For a £50 donation ("Silver Angel") As "Angel" + signed programme + cast photo. For a £70 donation ("Golden Angel") As "Silver Angel" + Behind the scenes tour of production + seats reserved. For a £80 donation ("Diamond") As "Golden Angel" + Meet the cast & crew. As "Golden Angel" + 1hr Acting/Mentoring class with JB, 2 free tix, free drink/nibbles at interval for 2. To get in touch.... just click or tap the envelope icon next to our name on the campaign up at the top. Wow! We've had a late surge in donations. Thank you sooooo much to our recent donors!! The Warm Glow factory is open again for business! We're going to keep the campaign going a little longer to try to get closer to our initial £1.5k target as the sad shortfall in audience figures has meant that the one writing all the cheques doesn't yet get to write one to himself. Sad but true. Please do keep plugging the campaign to your networks if you can... as bringing this project to fruition has taken Individual #1 two and half yrs of work, and sadly altho the Warm Glow is seriously gorgeous, and Individual #1 absolutely wouldn't have it any. other. way. .... The Warm Glow and The Bills have been looking at each other with bemusement and scratching their heads! Also... on another note......we're bringing Betsy back to Brighton Fringe in May, so keep yer eyes peeled for that.! It's now a fortnight since OOOM came down from the stage at Tara Arts. We did it! Thanks in a big part to you and your support and belief in us. A big thank you too to all of you that managed to get along to see the play. We had some great reviews, and some wonderful audience feedback and we'll be writing to you directly to let you have a look at some of that so you know what it is that you achieved. We played 20 performances, ran 5 free workshops, and had one showcase performance for our workshopped boys. For now.... Here's our latest webpage on the project. Our lovely Donors. Your names (unless you donated anonymously) are being added to our programme, and soon it's go to print. We're now at 6/10 of the way to our target, and day by day, small and larger lovely gifts arrive in our collecting box. Today we had SM Emily M-B right there to help us keep an eye on Stage Management issues, and Technical Operator Paul Thomas with us too, busily programming Qlab (this is our sound cue software) to ensure the soundscapes and music, that augment the action, are all in place. The last piece of gorgeous original and specially composed music has arrived from musician Dirk Campbell and included in the mix. Yesterday, Costume and Set designer Sorcha Corcoran was with us, to ensure that the actors go on with something to wear. We hope you'll all be coming to see our show. We've broken through the half way barrier! Wow... over 20 wonderful donors, and we're nearly at opening night. We've finished our 5 outreach workshops with teen boys, Helen Parlor, Mark Nightingale, the actors, and JB. Jonathan Kennedy - Tara Interim Executive Director. 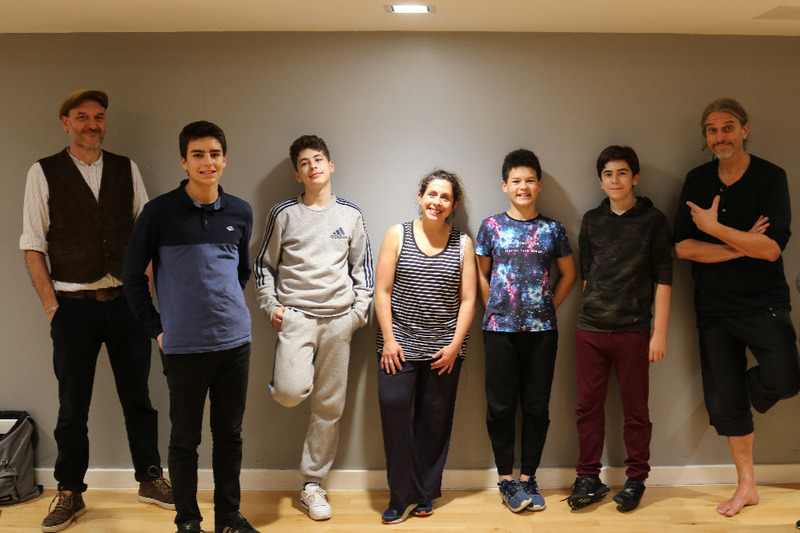 Helen Parlor - Movement Director who’s been co-holding our workshop with the boys, and has some more rehearsals to do with them and the actors. Vincent Kerschbaum - Actor playing Saif. I'd love to show you a picture of everyone togedda, but they're rarely in the same room! Instead, let me tell you that Sorcha came and measured the actors today. They're all the right size. And we shifted our rehearsals for our last 1 1/2 weeks to Tara Theatre building today. Tomorrow more props and set arrive, We'll run Act 1 and 2 again too, (we ran the whole play last Friday and it's already in fine shape.) and act 3 on Weds. See you soon! ....and thanks for donating!